Productive orbital floor sanding requires the right amount of force (pressure) to be applied to the abrasive so that it sands at its most efficient in relation to the size of abrasive grit. Typically more pressure is required the coarser the abrasive grit. The HTF's design applies the ideal pressure across the whole surface area of the abrasive. For all types of wood floors and decking. See for yourself, click the link below to calculate the abrasive pressure for different sanding pad sizes and machine weight. Biased off switch prevents the HTF from accidental start-up protecting operator and property. 7m (23') power cable with non-marking outer insulation prevents marking of newly sanded floor. Quick release handle for fast breakdown and easy transport. Precision moulded brush block with brass brush holders and constant force brush springs. High powered vacuum system, with seated oversize wide bladed alloy vacuum fan. 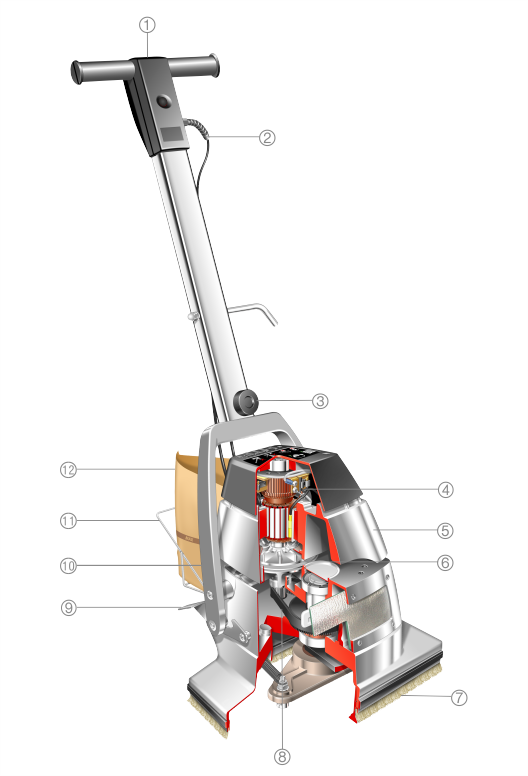 Brush skirting maintains dust within vacuum area to maximise dust collection. Tooth drive belt and hardened steel gear cut pulleys. Foot operated peddle releases handle for operation, locks handle in upright position for storage. Floating handle design allows body of HTF to float across floor surface under finger tip control providing the ideal working height at all times. Dust bag support folds up in storage and provides support when changing abrasive without damage to the dust bag. Disposable paper bags for efficient and safe dust collection read more. Weight: 94.8lbs (45.0kg) without HTF weight, 176lbs (80kg) maximum recommended with HTF weight. Note: Typically the weight of an 18" x 12" orbital floor sander is centred around the middle of the machine in-line with the motor and not evenly distributed over the whole of the sanding pad. The HTF can apply up to nearly 41/2 times the force (pressure) to the abrasive than a typical 18" x 12" orbital floor sander.